Energy brokers licenses are required in 13 of the 50 states. The renewal dates and application fees vary as do the length of the application process. Different states require copies of various documents pertaining to your organization and in some states you are required to obtain a surety bond. Certain states might not require an energy broker license but could require you to obtain a basic business license to do any type of business in the state. You might need to apply for sales and use tax and if you have employees, you will need to set up withholding tax and possibly unemployment insurance. 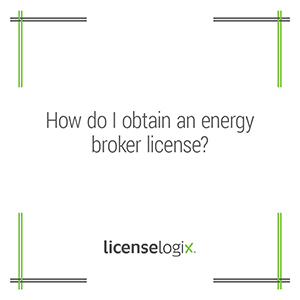 We license in all 50 states and can help you determine if you need an energy brokers license in a particular state. First we would send you a questionnaire to identify which states you will be conducting business. We will then do the license research to determine exactly what you need in each jurisdiction you identified. Our license experts will compile all of the applications for you and provided detailed instructions on how to apply and the fees associated with each application. Should you not want to deal with the hassle of submitting applications to multiple jurisdictions LicenseLogix can complete all the applications for you and streamline the process. The pricing for our services vary depending on the extent of services you wish LicenseLogix to perform. You can get a quote by submitting a request or by calling (800) 292-0909.